From left: U.S. Presidential Scholars Program nominees Austin Williams and Abi Vargo, JMHS seniors. 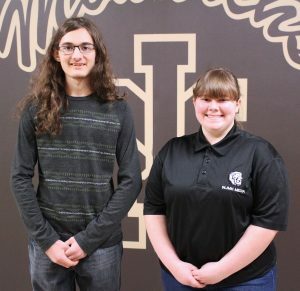 John Marshall High School seniors Abi Vargo and Austin Williams have been selected as candidates for the prestigious United States Presidential Scholars Program. Established in 1964 by Executive Order of the President, the U.S. Presidential Scholars Program recognizes and honors distinguished graduating high school seniors. While students are automatically eligible for nomination during their senior year of high school, each must qualify in one of the three paths of accomplishment to be considered. Vargo was chosen based on her Career & Technical Education (CTE) accomplishments at JMHS. She is a dual CTE Completer who is enrolled in the Broadcasting and Business programs. Williams was selected based on his SAT scores and his overall academic achievements. Students can also be picked because of their artistic abilities. All students must be endorsed by their Chief State School Officer. Both Vargo and Williams were recommended by Dr. Steven Paine, West Virginia State Superintendent of Schools, for the national accolade. The nomination, however, is just the first step in the program’s process. Nominees go through a lengthy application procedure. Students submit essays, self-assessments, secondary school reports and transcripts to the White House Commission on Presidential Scholars. Applicants are then evaluated on academic achievement, personal characteristics, leadership, service, extracurricular activities and essay content. Approximately 800 students will qualify as semifinalists of one of the Nation’s highest honors for students. Those names will be disclosed on Wednesday, April 17, 2019.